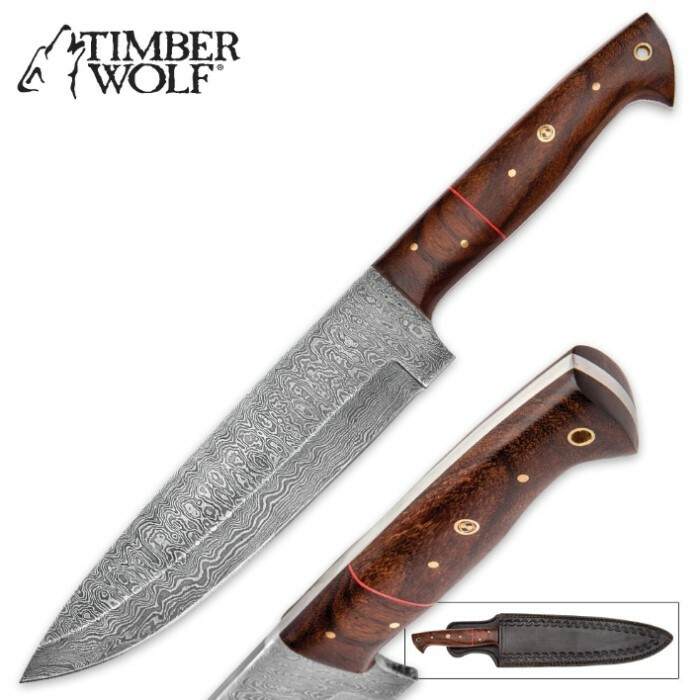 Timber Wolf Cheyenne Multipurpose Fixed Blade Knife - Damascus Steel and Tali Wood | BUDK.com - Knives & Swords At The Lowest Prices! From the home kitchen to remote back country trails, Timber Wolf's remarkably versatile "Cheyenne" Fixed Blade Knife makes quick work of practically any task you throw at it. But it's much more than just a rugged workhorse, boasting an abundance of beauty to accompany its impressive brawn. Forged from breathtaking Damascus steel, the robust 8 1/2" drop point blade is a whirlwind of hypnotic ripples, waves and ellipses. This spectacular melange of contrasting lines is the result of an ancient metalsmithing technique that involves painstakingly firing, folding, hammer welding, quenching and acid etching high carbon steel. The laborious process is repeated over and over - sometimes for days on end - until the desired look is achieved. 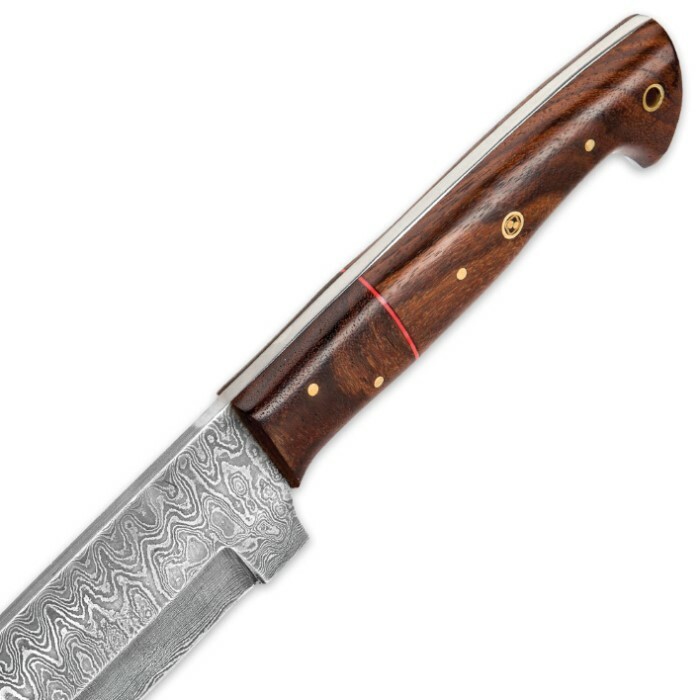 Such meticulous craftsmanship can only be done by hand in primitive forges; there's no mechanized mass production, and, like a fingerprint, the Damascus steel in each Cheyenne knife is charmingly unique. But the legendary steel isn't all looks - it's hard yet flexible, allowing for a resilient, razor sharp edge. Every Cheyenne blade is carefully honed, so its keen and ready for action right out of the box. Such a striking blade deserves to be wed to an equally stunning handle, and the Cheyenne delivers in spades. Carved from exquisitely exotic tali wood, the handle is incredibly tough, ergonomically contoured and blanketed in rich, natural shades of caramel, mocha and umber. Gleaming brass rivets and a delicate orb-filled rosette provide stately finishing touches to this masterwork of bladesmith artistry. 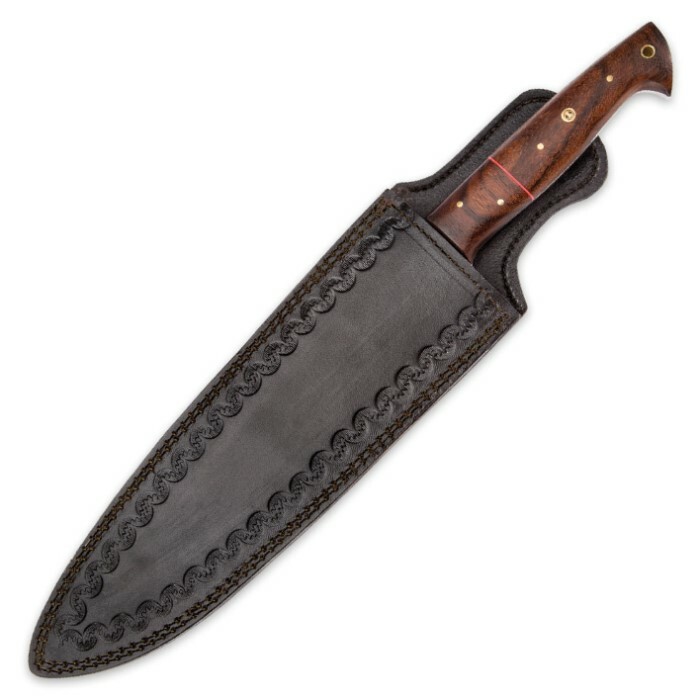 The Cheyenne includes a handsome genuine leather belt sheath for easy transport in the field, but its breathtaking, undeniable beauty makes it equally well suited to display - on its own or in a fine knife collection. Regardless of what you decide to do with Timber Wolf's outstanding Cheyenne Fixed Blade Knife, you won't be disappointed to say the least!